Misc. 19	A cylindrical tank of radius 10 m is being filled with wheat at the rate of 314 cubic meter per hour. 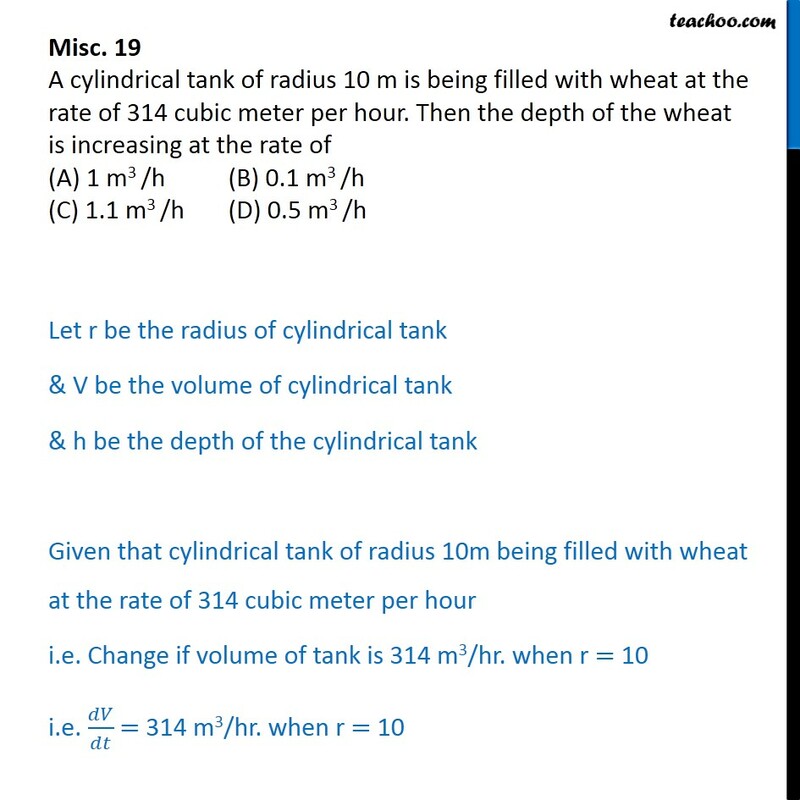 Then the depth of the wheat is increasing at the rate of (A) 1 m3 /h	(B) 0.1 m3 /h (C) 1.1 m3 /h (D) 0.5 m3 /h Let r be the radius of cylindrical tank & V be the volume of cylindrical tank & h be the depth of the cylindrical tank Given that cylindrical tank of radius 10m being filled with wheat at the rate of 314 cubic meter per hour i.e. Change if volume of tank is 314 m3/hr. when r = 10 i.e. ﷐𝑑𝑉﷮𝑑𝑡﷯ = 314 m3/hr. when r = 10 We need to find at what rate depth is increasing i.e. 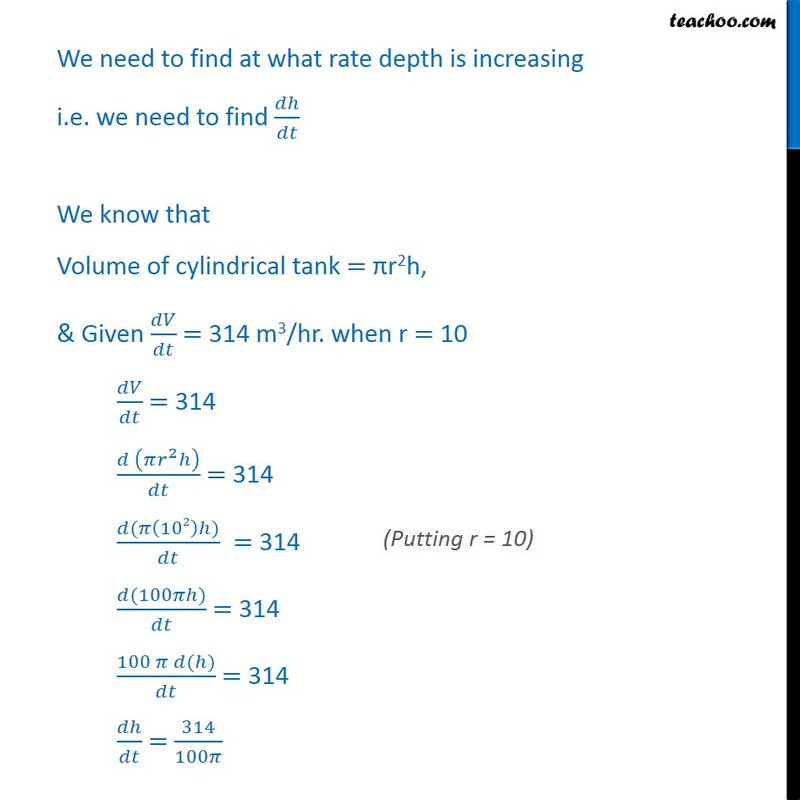 we need to find ﷐𝑑ℎ﷮𝑑𝑡﷯ We know that Volume of cylindrical tank = πr2h, & Given ﷐𝑑𝑉﷮𝑑𝑡﷯ = 314 m3/hr. when r = 10 ﷐𝑑𝑉﷮𝑑𝑡﷯ = 314 ﷐𝑑 ﷐𝜋﷐𝑟﷮2﷯ℎ﷯﷮𝑑𝑡﷯ = 314 ﷐𝑑(𝜋﷐102﷯ℎ)﷮𝑑𝑡﷯ = 314 ﷐𝑑(100𝜋ℎ)﷮𝑑𝑡﷯ = 314 ﷐100 𝜋 𝑑(ℎ)﷮𝑑𝑡﷯ = 314 ﷐𝑑ℎ﷮𝑑𝑡﷯ = ﷐314﷮100𝜋﷯ ﷐𝑑ℎ﷮𝑑𝑡﷯ = ﷐314﷮100 × 3.14﷯ ﷐𝑑ℎ﷮𝑑𝑡﷯ = ﷐314﷮314﷯ ﷐𝑑ℎ﷮𝑑𝑡﷯ = 1 Since depth is in meter & time is in hr So, ﷐𝑑ℎ﷮𝑑𝑡﷯ = 1m/hr. 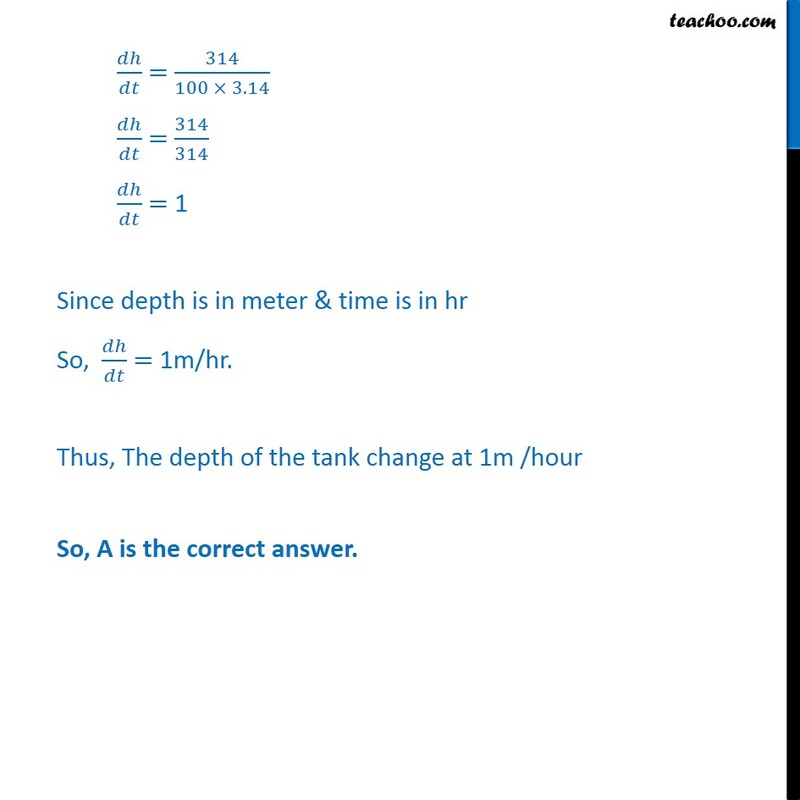 Thus, The depth of the tank change at 1m /hour So, A is the correct answer.